Hello! I didn't have a chance to upload this yesterday, but it's the card I made for the Try a New Technique Challenge on SCS. We were to make a Tri Shutter Card. These are so fun, and the possibilities are endless! It folds right up and fits into an A2 envelope! 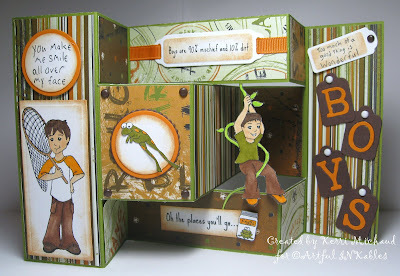 I once again used this fabulous set from Artful INKables called Boys Will Be Boys. The dp is from KaiserCraft called Rough & Tough. I distressed most of the panels with Ranger Tea Dye Distress Ink and added a few brads. The letter tags are from Sizzix Alphabars Doodle Tags dies. Thank you so much for stopping by and have a wonderful rest of your day! Kerri, this is fabulous!!! Great design and I love your details!!! The little boy hanging from the vine is awesome!!! Wow! Outstanding card! Incredible! I agree with Denise - The Best card ever!!!!!!!!!! Kerri you are AMAZING!!! I don't know where you get all the creativity but it blows me away!! Love this card!! INSANE - I can't believe someone can MAKE a card like that....unbelievably awesome!! This is so neat! I love it! What an awesome card for a little boy!!! This is a really cute card, Kerri! I like the images, and the paper you used. Honestly, the coolness of this card is beyond description. LOVE the boy swining freely and all the little touches added to make it all seemlessly go together. Great job!